The series of photos on the front page of the ruling workers' party newspaper showed something North Koreans never would have imagined just months ago — their leader Kim Jong Un warmly shaking hands with President Donald Trump. The priority treatment of what even Pyongyang is calling the "historic" meeting between Kim and Trump in Singapore underscores just how much of a propaganda coup the North saw in Tuesday's unprecedented summit. Dubbing it the start of a new relationship between their countries, which are still technically at war, Pyongyang's first reports Wednesday stressed to the North Korean people that Trump agreed at Kim's demand to halt joint military exercises with South Korea as long as talks toward easing tensions continue and suggested that Trump also said he would lift sanctions as negations progressed. 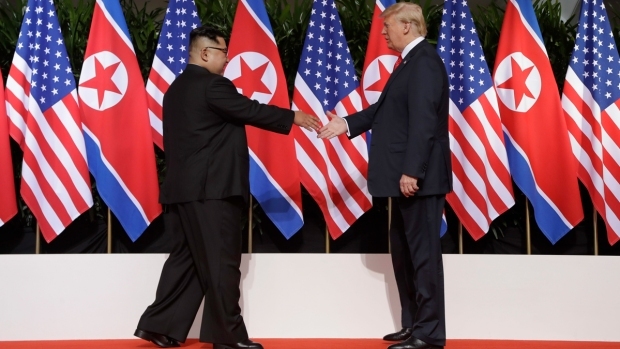 "President Trump appreciated that an atmosphere of peace and stability was created on the Korean Peninsula and in the region, although distressed with the extreme danger of armed clash only a few months ago, thanks to the proactive peace-loving measures taken by the respected Supreme Leader from the outset of this year," said a summary of the leaders' summit by the North's state-run Korean Central News Agency. 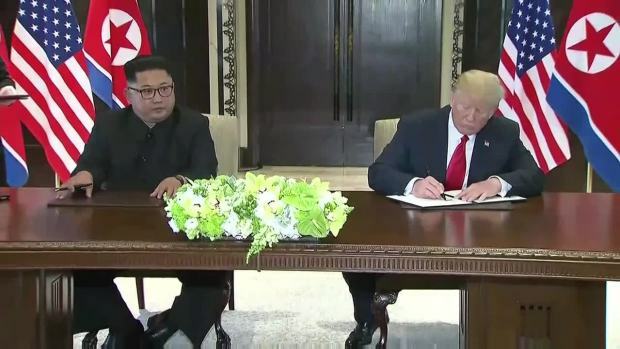 The summit capped a swift and astonishing turn of events that began on New Year's Day with a pledge by Kim to reach out to the world now that his nuclear forces have been completed. His focus on diplomacy, including earlier meetings with the leaders of China and South Korea, is a sharp contrast with his rapid-fire testing of long-range missiles and the fiery exchanges of threats and insults last year that created real fears of a war on the Korean Peninsula. Kim's vows to denuclearize were reported by state media Wednesday within that context — that Pyongyang would respond to easing of what it sees as the U.S. hostile policy against it with commensurate but gradual moves toward "the complete denuclearization of the Korean Peninsula." "Kim Jong Un and Trump had the shared recognition to the effect that it is important to abide by the principle of step-by-step and simultaneous action in achieving peace, stability and denuclearization of the Korean Peninsula," KCNA reported. That doesn't seem to pin the North down to the concrete and unilateral measures Trump said he would demand going into the talks and it remains to be seen what significant changes could occur now that they seem to be moving toward more peaceful relations. Both sides promised to push the process forward quickly, and Trump and Kim exchanged invitations to each other to visit their nations' capitals. Interestingly, the North made no secret of China's behind-the-scenes presence at the summit. A flurry of media coverage the day Kim arrived in Singapore showed him waving from the door of the specially chartered Air China flight that brought him from Pyongyang. In the meantime, however, the North appears to be basking in its leader's new found status as the most popular kid on the block. "Singapore, the country of the epoch-making meeting much awaited by the whole world, was awash with thousands of domestic and foreign journalists and a large crowd of masses to see this day's moment which will remain long in history," KCNA noted.